Word on the street, apparently confirmed by this photo which was tweeted by Arizona AD Greg Byrne, is that former Michigan head coach Rich Rodriguez has been named the next coach at the University of Arizona. 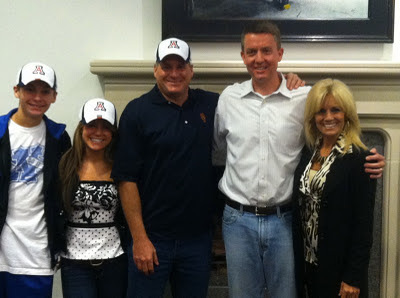 Believe me when I say that personally, I could not be happier for Rich Rodriguez and his family. So many words have been typed on these pages over the last 4 years about that man, his work at the University of Michigan, and the lasting effects he's had on this football program. When Rich was fired, it seemed like the logical, and frankly, the most merciful thing at the time. He was just never going to be as successful here as he wanted or needed to be. Was it fair? Not really. But ultimately, David Brandon made his decision and Rich's time at Michigan was over. At the time, we said our piece and wished Rich well wherever he should end up. Arizona fans, if you're reading this, you got a great coach. He's going to cherish his players and teach them what it takes to win not only on the field, but at life. High praise? Sure. But he's the real deal who's won everywhere he's been besides Michigan. But don't let that fool you...Michigan is a beast. It's a tough racket if you're not the right guy for the job. I'm just happy that Rich is going back to coaching, where he belongs. Congratulations Rich. We wish you well in the desert. Props to Brad for being on top of the news! I don't think any other Michigan blog broke this story yet.